May is getting nearer and its only 10 weeks until the Bupa London 10K in which I’d love to be able to keep up my record of getting a new PB each time. As most of my runs, whatever the distance, are at a similar steady pace of around 9/9+ish min per mile I decided it was time for a bit more speed and to get used to my ‘race pace’, whatever that may be. Last year I ran the race in 50.38 which was an average pace of 8.08. (I’m not sure how that happened, maybe my friend and pacemaker really did carry me as I dreamt!). So if I am to beat last years time I need to run it at an average pace of 8 min per mile or faster. Errm help? Today I made a date with myself to run 5K at ‘race pace’ or as near as possible to 8 min per mile. I went to the park where I could run without worrying about crossing roads and wouldn’t bump (literally) into someone I knew red-faced and sweaty or half dead. It was very hard work! My legs felt heavy and I was gasping for breath. It took me a while to settle into the right pace and my mile splits show I did my usual mistake of starting off too fast. 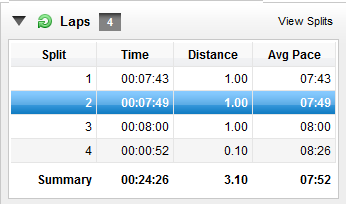 The fastest pace was a ‘full on’ run and 8 min plus pace didn’t feel much easier! What did I drink/eat/inhale before last years race? So its time to get a good training plan and get on with the long runs. I’m into new territory as up until now I’ve relied, as a beginner, on my increasing fitness from regular BMF classes and/or a couple of runs a week to make improvements in my race times. To improve my times this year I will have to put in some hard work, train smarter and read up on interval paces and reps etc. All advice gratefully received! Please! This weekend I’m running the Military 10k with no stop watch or garmin to fret over my time (don’t want to ruin it). Instead I’ll be watching my feet in the water, up muddy banks and over various obstacles and hoping to make it to the finish before lunch time and in front of at least 1 live person regardless of how long it takes! It should be a laugh and I’m ‘sort of’ looking forward to it. Hopefully I’ll have some suitably embarrassing photos to post afterwards. March challenge update since my last post. After killing myself last Wednesday I rested on Thursday and on Friday I let my social life take precedent. Saturday 9.12 mile run and on Monday BMF class. Tuesday 3.1 miles tempo run. March total. 15/22 days. 48.96 miles. Categories: Uncategorized | Tags: 10K training, Bupa London 10K, Military 10K, pace, Races | Permalink. Super-speedy! Good luck with the training – I’m aiming for 58 minutes so I am in awe of you, super-woman. Blimey – that is awesome…I won’t see you for dust! If I get under an hour it will be a miracle! 8 min miles stuff my dreams are made of! Wow! My only advice is to ensure that if you do get a pb, make sure it’s only by 1 second, thus making next year’s pb chasing easier than would otherwise be the case… If only I’d been advising you last year too, this year’s pb would be so much easier for you. I’ve signed up for a 7 mile race just for the guaranteed pb! wow! I can only dream of 8 minute miles 🙂 good luck!! I am no good with speed, but believe that doing speed training like fartlek can help?